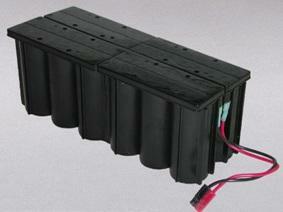 4X0819-0012W : 24 volt 2.5 Amp-hour Sealed-Lead rechargeable battery assembly for Utility Power Line Reclosers. Made with maintenance-free lead batteries in black plactic housing. Size approx. 8.75" x 2.75" x 3.75". This is a Sealed Lead Acid rechargeable battery pack designed to work in Cooper Power Systems (McGraw Edison) FXA, FXB series power line reclosers. Cross-reference replacement # KFX-105-1. Additional shipping & handling charge is applied to each unit, due to excessive weight.